Could not load file or assembly 'PostSharp, Version=3.2.18.0, Culture=neutral, PublicKeyToken=b13fd38b8f9c99d7' or one of its dependencies. The system cannot find the file specified. The DLL is not being copied into Project A's bin. All other external references from Project B are being copied across just fine, which is what is confusing for me. Note: Using Visual Studio 2013. 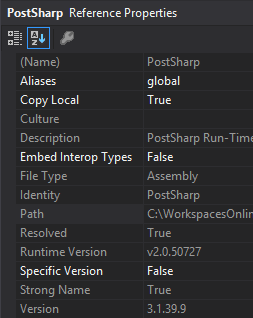 Add a reference to PostSharp in Project A. Add dummy code in Project B so that the compiler would detect that the reference is being used. Add a build event to force copy the DLL. I don't like any of the above solutions. They are hacks in my opinion and will only make for a more unmaintainable solution in the long run. I have fixed the problem by using a common output directory. This seems to be a recommended solution by many. I have also experienced much faster build times. See this Stackoverflow post. When I ran into this problem it was because I changed a project's name, but did not change the assembly name - it was identical to the assembly name of another project in the solution. I've added some dummy (unused) code on Project B, making reference to the DLL needed. Thus, the compiler will guess that it must copy the DLL into project A output. Not the answer you're looking for? Browse other questions tagged c# .net visual-studio .net-assembly solution or ask your own question.